Quran for kids tells some stories. We are presenting one of theose here. Musa a.s visited Firoan and called him towards Allah. Firoan asked who was your Lord. Mosa a.s replied my lord was the creator of the whole universe. HE created Sky and this Earth and whatever was in between these. Firoan said to his nation that did you listen whatever he said, He claimed that his Lord was your Lord and he was also the Lord of your ancestors too. Firoan said that it seemed that this person was crazy. Musa a.s said that he was not speaking on his own, he was just delivering the message of the Lord of East and West and whatever was in between these. Musa a.s informed if you had any wisdom you might understand this. Time passed and Firoan raised hatred against Musa a.s as much as he could. Quran kareem tells us that One day he warned Musa a.s to accept him as his Lord and said, “if you think that I am NOT your Lord then I will capture you.” Musa a.s said,” My Lord has blessed me as a messenger and I am his representative.” Then Firoan asked what he would get the reward if he admitted him as a prophet. Musa a.s said if you admitted me as a prophet and believed in my lord, HE wOULD bless you with three things. HIS first blessing would be that you would be young again, secondly, the area of your kingdom would be extended, you would be a King from East till West. The third blessing would be that your age would be increased and on the judgement day, there would be no questioning about your life. Musa a.s was ordered to speak politely that was the reason that he was speaking in a very soft and gentle way. Firoan said to Musa a.s to present arguments and supernatural acts to support his claims and to prove him trustworthy. Musa a.s said that I had one thing if I showed that, you might believe me. Musa a.s hid his hand in his armpit and then showed it to Firoan. It was glittering like the moon. In fact, its glitter was more than the moon. It’s shining was very attractive. Firoan became frightened He said to Musa a.s that he wanted to kill him or he wanted to make him a companion. In Koran Kareem following prayers is written. 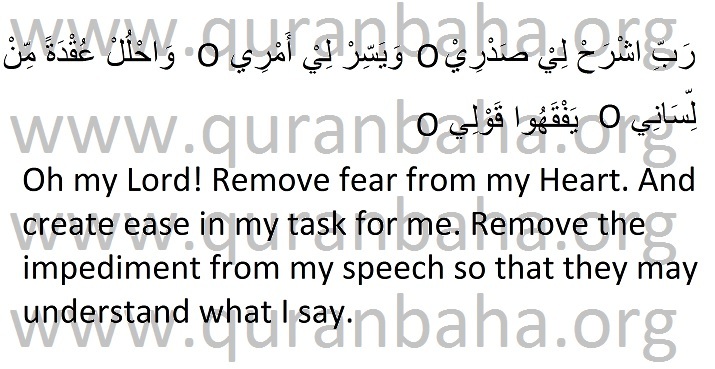 It is believed that this prayers is very effective in increasing the abilities of kids. of Quran recitation. We will discuss it in next story. If we teach such stories of Quran to our kids , there will many advantages, Our Quran recitation will improve and kids will get true knowledge.